Balancers are registered hybrid seedstock with documented pedigrees and EPDs. Balancers combine Gelbvieh and Angus (red or black) to provide commercial cattle producers with a fast, management-friendly path to the Continental x British industry target. Balancer is a registered trade-mark of the American Gelbvieh Association. Only AGA members can produce and register Balancer hybrid seedstock. Balancers are 25 to 75 percent Gelbvieh with the balance Angus or Red Angus. 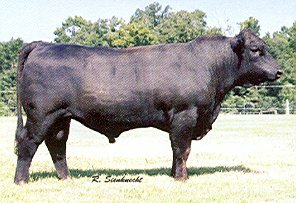 All polled, Balancers combine Gelbvieh's growth, muscle, leanness fertility and unequaled pounds of calf weaned per cow exposed with the calving ease and marbling of Angus. You choose the level of Gelbvieh in your Balancer genetics to fit your cowherd the best. Documented research from the USDA Meat Animal Research Center proves that Balancer and other managed composites offer as much consistency as using the parental breeds separately. "Hybrid genetics are successful in combining reproduction, growth and carcass traits into simple, well-designed breeding programs for the commercial industry. The use of F1 (first cross resulting from two purebred parents) bulls much like your Balancer program goes a long ways towards providing a simple crossbreeding solution."